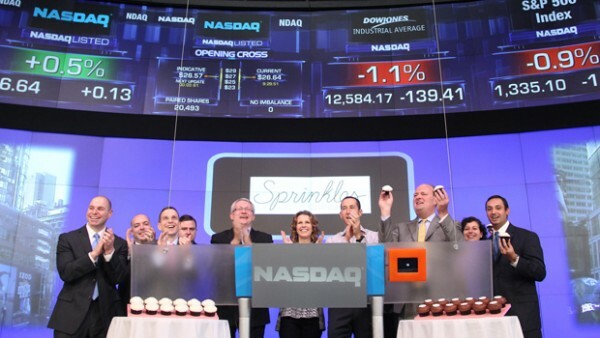 Sprinkles Founders and Cupcake Wars Stars Ring Opening Bell at Nasdaq. Food Network judge of “Cupcake Wars” and founder of Sprinkles Cupcakes, Candace Nelson, will visit the NASDAQ MarketSite in New York City’s Times Square. In honor of the occasion, Candace and her husband, co-owner and founder of Sprinkles Cupcakes, Charles Nelson, will ring the opening bell for the stock exchange on Friday, signalling the start of the trading day. We’re not sure what the tie is with Nasdaq. The publicist for Sprinkles says that it is to celebrate the opening of Sprinkle’s first location in New York City. But we wonder if the stock exchange is wooing the fast growing company. The Sprinkles website lists locations that are open in 10 cities, and they’re asking visitors to vote on what city to open next from a list of more than a dozen more. Sprinkles owners Charles and Candace Nelson are no strangers to Wall Street as former investment bankers. They say they have a penchant for sweets and a head for business. Candace is a culinary school graduate who honed her skills baking batches of decadent cupcakes in her West Hollywood kitchen before opening a store in Beverly Hills in April, 2005. Sprinkles Cupcakes are baked fresh in small batches throughout the day and handcrafted from the finest ingredients, including sweet cream butter, bittersweet Belgian chocolate, pure Madagascar Bourbon vanilla, fresh bananas and carrots, real strawberries and natural citrus zests. Topped with Sprinkles’ trademark modern dots, rich chocolate sprinkles from France, or seasonal sugar decorations, Sprinkles Cupcakes are a deliciously sophisticated update on an American classic.